Opinion blog by Ted Stimpfel, CSD Board candidate. 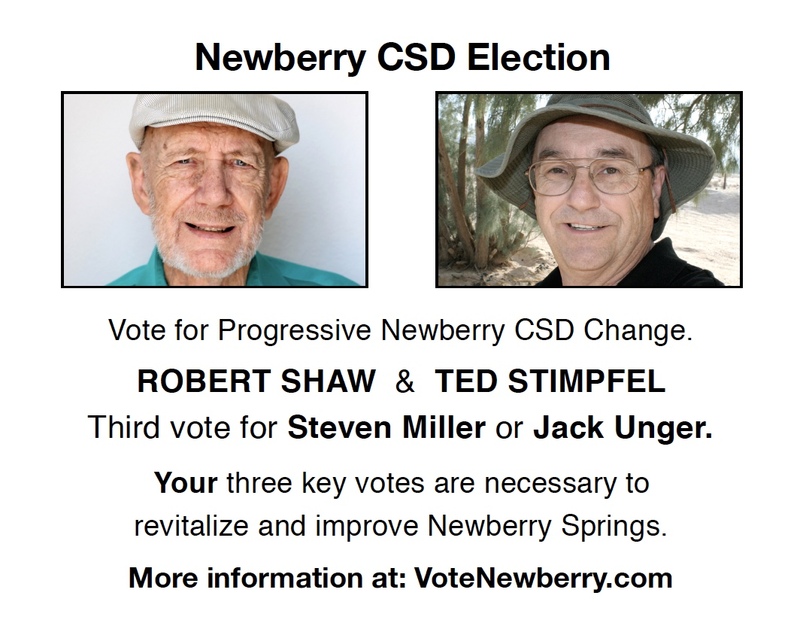 The Newberry Springs Property Owners Association has been posting flyers inviting local residents to attend a Newberry CSD candidates 'Meet & Greet' scheduled for Wednesday, October 3, 2018, at 6 P.M., at the Newberry CSD building located at the south end of Newberry Road. Lacking proper protocol, the Property Owners have failed to formally invite the candidates and no one, especially the candidates, seem to know what is going on. The confusion lies in the Property Owners' Facebook page that states, "Karen Gray of Newberry has kindly volunteered to officiate at the event" and that the candidates may "...answer a few random questions submitted." Well, that sounds more like a candidates debate with Gray as moderator. The candidates, like most people, have busy schedules and the lack of a courtesy invitation well in advance of such an event is presumptuous. Congressional debate at Barstow Jr. High School in 2012. Having been a principal organizer of the Congressional Candidates Debate held at the Barstow Jr. High School back in March 2012, which packed the auditorium with over 300 attendees, and that had a previous U.S. Senate candidate (Nevadan legislator Sharron Angle) from Reno who was flown in to moderate, this writer appreciates the very hard work of the many people involved in properly organizing a debate. So, it was nice that the Property Owners Association stepped-up; but proper protocol is to send a formal invitation to the candidates with an RSVP request. The invitation should include a clear description of the event and an introduction of the officiator. If there is to be debate questioning, the invitation should include a formatted outline of the structure of the debate, such as how the candidate seating is to be arranged and selected, who and how will the questions submitted be sorted and selected and asked, and how much time the candidates will have to answer the questions? Will there be rebuttals? Will the candidates be allowed an opening statement, a concluding statement, and how much time is allowed for each? What is the event's timetable? Will there be a 'Meet and Greet' period before and/or afterward? There are many additional questions such as allowed breaks and will the candidates be allowed space to set-up a display? Candidate debates often become long, drawn-out ambushes for candidates... and they know it. Candidate debates easily go array if a weak moderator loses audience decorum whereby candidates are unfairly attacked by audience snickering or verbal outbursts on a candidate's unpopular viewpoints. It is important that the organizer gains the trust of candidates by establishing a tone of professionalism in the candidate's invitation. please visit and LIKE our Facebook main page.